New Orleans, 1880s. Sent to watch over the decadent city, the angel Gabriel loses himself in the liquid pleasure of absinthe. So when his mistress, Anne, is murdered — and all evidence points to him — a foggy Gabriel cannot be sure he didn't do it. His penance: to be forever denied love. Should he seek pleasure with a woman, she'll know the depths of despair. New Orleans, today. Hoping to unlock that unsolved mystery, forensic scientist Sara Michaels, Anne's great-great-granddaughter, meets the ageless, tormented Gabriel. To work together would mean suppressing their mutual attraction — he can't allow himself to touch Sara, for her own sake. And for Sara, already familiar with the dangers of addiction, Gabriel poses the ultimate threat to her self-control. But can the desire burning between them turn into their salvation — or lead them both to destruction? Look for FALLEN, a darker paranormal novel by Erin McCarthy, available today from your favorite bookseller! Watch Erin McCarthy tell about getting 'the call' on RomanceNovel.tv. Author Barbara Colley's Charlotte LaRue Mystery Series features a New Orleans maid service owner who's often called on to clean up more than just her clients' homes. Whether it's a dead body or simply a missing piece of jewelry, Charlotte seems to have a knack for solving mysterious crimes, a trait that amazes those who know and love her, but a trait that also constantly frustrates and aggravates the police. In Wash and Die, book 7 in the series, Charlotte herself is on the list of suspects. Find out more by visiting Barbara Colley and while you're there, treat yourself to a peek at the recipe page for some authentic southern cookin' and New Orleans treats. In Mommy for Rent by Lori Handeland, it's when a Rent-a-Mommy job for the Mother's Day Picnic turns into the real thing. In Along Came a Daughter by Rebecca Winters, it's the day a daughter goes to work for her dream mom...and then has to wait for her dad to fall in love. In Baby Steps by Anna DeStefano, it takes a troubled little boy to help a woman take baby steps toward a loving future with her husband. Three stories of mothers' joy, laughter ... and exasperation! 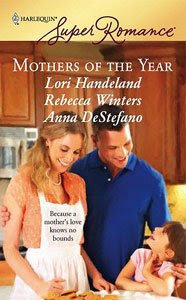 Look for Mothers of the Year at your favorite bookseller starting April 8th. Just in time for Mother's Day! Eclectics.com authors Erin McCarthy and Laura Joh Rowland will attend the fifth annual Writers’ Jubilee Jambalaya this weekend (Saturday, April 5, 8 a.m.- 6 p.m.) at the Terrebonne Parish Main Library, 151 Library Drive in Houma, Louisiana. Tickets are $35. Visit the library for more information.